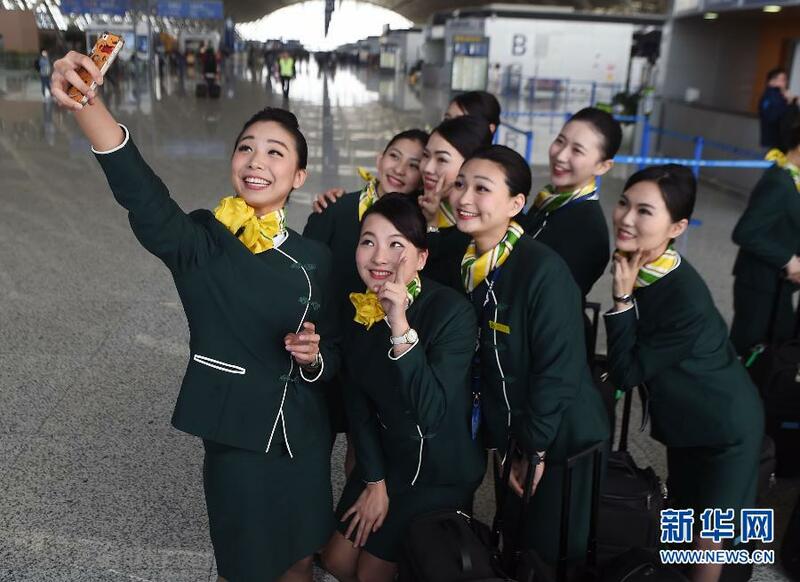 Twenty-four flight attendants from Taiwan have joined Shanghai's budget carrier Spring Airlines and will serve on flights starting on Thursday. On the 9C8951 flight flying from Shanghai to Taipei, Taiwan flight attendants Hsu Shao-ping and Wang Chun-I are catching the eyes of the passengers. Hsu, 34, was once a journalist in Taiwan. "Taiwan is so small, so I want to take this chance to see more of the world," she said. Wang, 29, worked as a terminal attendant in a rapid transit company in Taiwan. He said that he would like to embrace new life experiences by working in the mainland. The airlines started to recruit flight attendants from Taiwan beginning last October. About 1,000 people applied for the recruitment. Among the 24 newly employed, two are men and 22 are women, according to Xiao Fei with the human resources department of the company. Xiao said, most of the Taiwan flight attendants have never been to the mainland before and are full of expectations for life in the mainland. Many of them have engaged in voluntary jobs and are passionate about helping others, and they mostly have a good command of English, he said.